Product prices and availability are accurate as of 2019-04-08 10:23:27 EDT and are subject to change. Any price and availability information displayed on http://www.amazon.com/ at the time of purchase will apply to the purchase of this product. 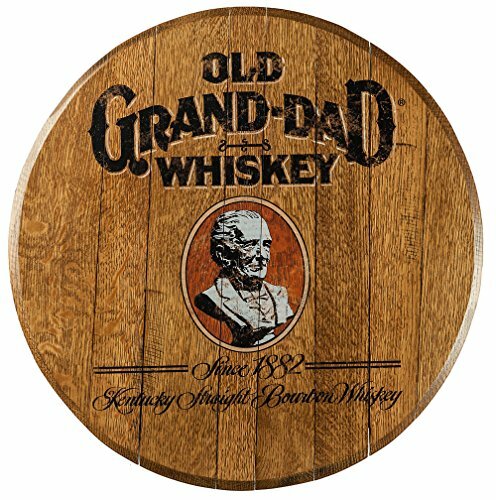 For your favorite bourbon lover this unique bourbon barrel head with an Old Grand-Dad logo design imprinted on top makes a distinctive addition to any room, office, or bar area. Constructed from an actual used and repurposed bourbon barrels, this white oak barrel head has been mounted to a support panel with keyhole slots for hanging. The barrel char has been retained for authenticity and this high resolution direct print image is ready to hang. While each barrel head is slightly different due to its handmade construction, the barrel heads generally run 21" across and 1½" thick. Please allow 7-10 business days for the production of this unique piece. About the bourbon: First bottled in 1882, the bourbon that became known as Old Grand-Dad was specifically formulated with more rye for a lighter, spicier flavor and today is one of the Top 10 bestselling standard bourbons. 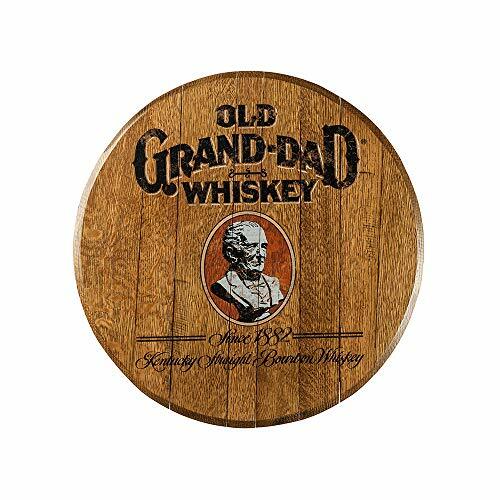 During Prohibition, Old Grand-Dad was produced by a pharmaceutical company, the American Medicinal Spirits Co., and was one of the few distilled spirits permitted to be prescribed as medicine. 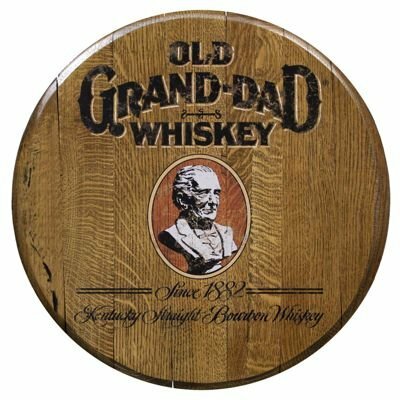 Old Grand-Dad was a distiller named Basil Hayden who made his name by distilling a bourbon whiskey made with a higher percentage of rye. Basil Hayden passed along the art of distilling to his son and then, in turn, to his grandson. It was the third generation distiller, Colonel R.B. Hayden, who honored his grandfather by naming his justly famed whiskey "Old Grand-Dad."